Your harp’s pedal caps, the black rubber pads that cover the tip of each pedal, are designed to give your feet traction as you move the pedals. Over time, and the more you use them, pedal caps wear away. In the case of the slip-on type, they can also split or crack, giving your harp a tired look. Fortunately, pedal caps are reasonably priced and replacing them can easily be done by the harp owner. As the name says, screw-on pedal caps are attached to the pedal via a screw from underneath. They cover just the top of the pedal where your foot goes. Slip-on pedal caps cover the whole tip of the pedal, and are slightly stretched to fit tightly over the pedal. Screw-on pedals are standard on Lyon & Healy, Salvi, and Swanson harps, though some Lyon & Healys use the slip-on type. Venus and Camac Harps use the slip-on types, as do old Wurlitzer harps. When replacing pedal caps, your best bet is to order new ones from your harp’s manufacturer. Lyon & Healy sells a slip-on cap, but I’ve found that they are too tight on Venus pedals, and prone to splitting. Lyon & Healy slip-ons do work well on Wurlitzers, however, and Lyon & Healy screw-on caps can be used on Swansons. Screw-on pedal caps are the most commonly found type. Slip-on pedal caps on a Venus Prodigy. To replace screw-on caps, you need to get access to the underside of the pedal. You can crouch down and flip the pedals up like you do when moving the harp. For easier access, you may also want to lay the harp on the floor so that the bottoms of the pedals will face up, or even elevate the harp by laying it down on a bed. To remove the old caps, unscrew the screw with a flat head screwdriver. The screw is very short, so it will only take a few turns. The new pedal caps should come with new screws, but if not you can reuse the old ones. Once the old cap is removed, fit a new one into place. It’s a little tricky to line up the cap’s screw hole with the hole in the pedal. It takes a little pressure from your hand to line them up. Once you do, screw the new cap back on and you’re done. The pedal cap screw is located underneath the pedal brass. Pedal brass with screw-on cap removed. Old slip-ons can sometimes be pulled right off, especially if they are cracked or split. If you have trouble, you can grab them with a pair of pliers and pull them off, but be careful not to damage the underlying brass of the pedal. Once the old ones are off, you may be able to push the new ones right on, but if they feel too tight, add a small amount of lubrication, such as 3 in 1 oil, to the mouth of the cap. That will get it started stretching over the widest part of the pedal. Be careful not to use too much oil, though, because a cap that goes on too easily can also slide right back off. Slip-on caps are pulled off to remove and pushed on to install. A drop or two of oil may help if the cap is tight. That’s all there is to it. Now you can get back to making some music. Cheers! Q: I have a Lyon and Healy 23 and I was given a gold crown for my birthday. I thought when I took off the wood crown that the gold crown would be an easy installation using the same holes for the screws. Guess I was wrong. Do you have any “installation for dummies” advice on how to install the gold crown? I just don’t want to do anything wrong. A: As this customer found out, installing a gold crown on your 23 is not a simple matter of taking one off and putting on the other. The screw hole locations are completely different. If you find yourself in her position, I offer the procedure below, which I developed when I worked in the final assembly department at Lyon & Healy. Please take care and use this advice at your own risk. I advise you to contact a professional technician to install your crown for you, but if that is not an option, carefully following these instructions should help you get the job done. 3. Set the crown lightly on top of the column. Ideally, the screw holes should point to front, back, left and right, but you need to avoid being too close to existing screw holes. Rotate if necessary so you can drill into virgin wood. 14 Tighten screws. It is best to go around in a circle from screw to screw, tightening each a few turns at a time. Splits in the soundboard veneer do not migrate into the board itself. So, you see some small cracks or splits running along the center strip on your pedal harp, and you’re wondering if this is a sign of scary expensive repairs to come. Fortunately, splits like the one shown in this photo are rarely a cause for concern. As ominous as they look, they are cosmetic, not structural. 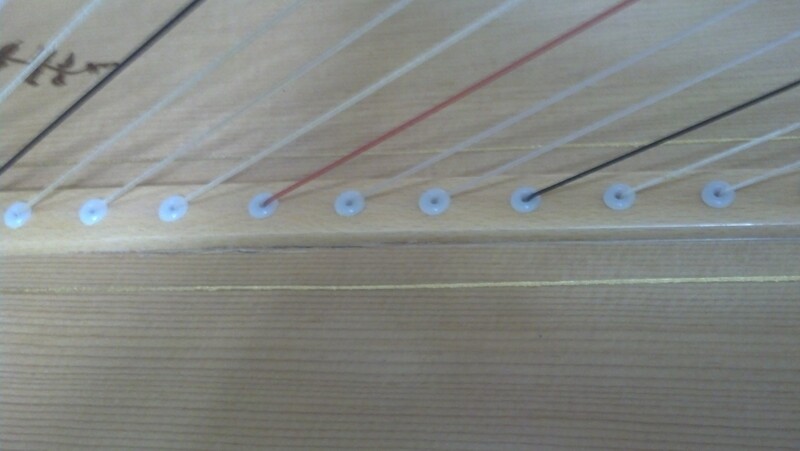 The wood grain on this harp’s soundboard appears to run parallel to the center strip, but the wood you see is only a very thin veneer. The grain of the underlying soundboard actually runs perpendicular to the center strip. While the veneer is splitting, there is no way this split will transfer into the soundboard, since the grain direction is different. If you have a pedal harp, take a flashlight and look at the underside of the soundboard inside the body. You’ll see that the grain of the board is horizontal back there, not running the length of the soundboard the way the top veneer does. In essence, the split you can see on the top is only “skin deep,” and won’t go past the surface layer of wood. Seen from behind, the grain of the soundboard runs perpendicular to the center strip. Why do these splits happen? 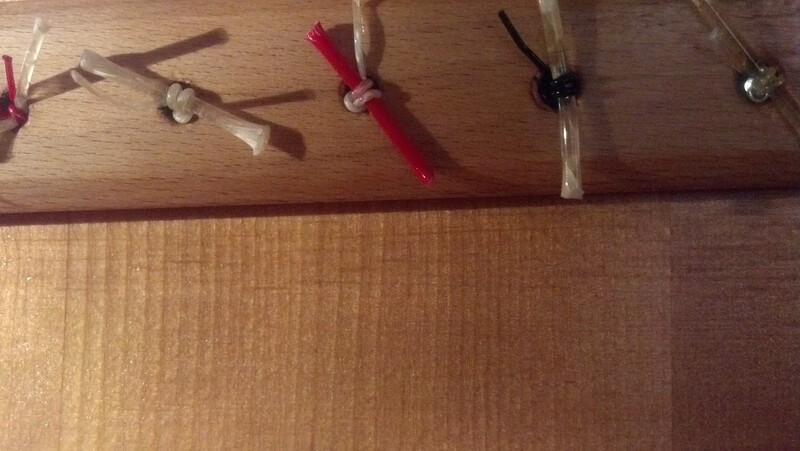 Under string tension, the soundboard is naturally pulled upward. As harps age, they develop a degree of bowing or “bellying” in the soundboard. This is actually an important part of the harp’s sound. A bowed soundboard is more resonant than a flat one. This is one reason sound improves with age. While the soundboard itself is built to withstand the stress of constant string tension, at least for several decades if not more, the veneer is literally paper thin. Moreover, wood is weakest along grain lines. 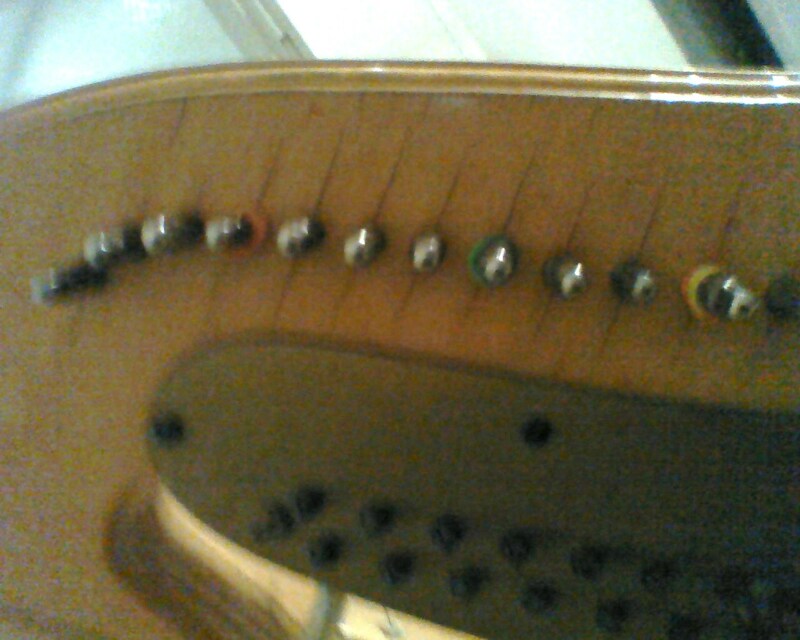 The tension on the board is highest right in the center where the strings are pulling. Where the underlying soundboard can flex under tension, the surface veneer can’t always follow suit. This can results in splits like the ones shown above. Can these be repaired? First of all, the word “repair” is probably too strong of a word. Nothing is really broken. Okay, you might say, can they be touched up? While I haven’t asked this question of a touch-up expert, I suspect any touc-up work would be temporary. This section of the instrument will continue to bow up over time, and finishes, like wood grain, don’t necessarily flex under tension. When is a crack in the soundboard something to worry about? If you notice a crack running parallel to the center strip, but about one half inch to one inch away from it, then you have cause for concern. Underneath the board, there is another center strip, much thicker and wider than the one on the surface. A split or crack along the edge of the larger bottom center strip can be an indication that the soundboard is on its way to coming apart. If you do see something like this, shine a flashlight at it. If you can see light on the other side of the soundboard, it’s time to start thinking about replacing the board, or the harp, depending on its monetary and sentimental value. There’s a new website called harptechguild.com, sponsored by the Lyon & Healy/Salvi Technicians Guild, that can come in handy when you need to know which technicians serve your area and when one will be coming to town. While I wish everyone in the world would just hire me to do their harp regulations, obviously that isn’t possible. I simply don’t go everyplace. Or I do come someplace near you, but sometimes the timing of my visit doesn’t work for you. Now, you can search technician service areas through harptechguild.com. The Lyon & Healy/Salvi Technicians Guild isn’t a guild in the purest sense. It is a group sponsored by the Lyon & Healy and Salvi Harp Companies. 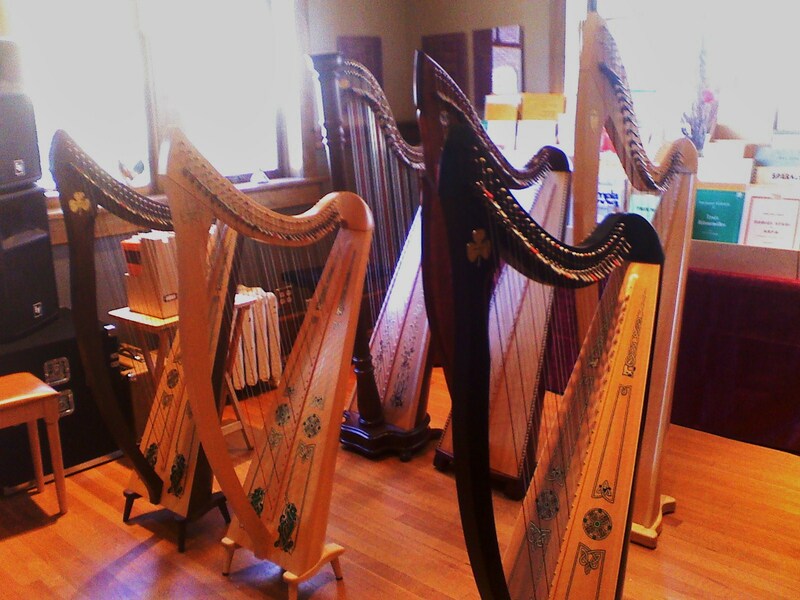 Technicians who are considered by these companies to be qualified to service their harps are admitted to the Guild. Members include technicians employed by both companies as well as independent techs like me who have extensive training and experience with these two brands. We get together periodically to share information and to learn from each other, and we regularly communicate about regulation issues and coordinate service for customers looking for technicians in their areas. The companies also use the Guild to keep independent technicians informed on advances and design changes happening in the factories. The members of the Guild pushed for the creation of a website where customers could find a list of technicians who service their area and access their contact information, as well as an online calendar listing service trips for each technician. Lyon & Healy and Salvi responded with harptechguild.com. The site is young, and admittedly not every member is using it to post a schedule, but you can find listings of highly qualified technicians who come to your area, and the listings cover the entire world. I encourage you to check it out. If you are connected to a harp society chapter or other harp group, i would encourage you to consider adding a link on your community website.